Our friends from Massimo’s Cucina Italiana are celebrating Moms this May and giving back to the local community at the same time. 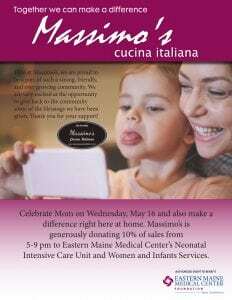 Make a reservation now to dine at the Bangor restaurant on Wednesday, May 16, and Massimo’s will donate ten percent of sales from 5 – 9 pm to Eastern Maine Medical Center‘s Neonatal Intensive Care Unit and its Women and Infants Services. And, we’re just as excited to announce that Eastern Maine Medical Center family is growing. We’re proud to welcome a new labor and delivery unit to our services on Monday, May 22.